Is it wrong to have a stairway or deck guardrail constructed with horizontal balusters or cables that could be climbed like a ladder? This topic came up in a discussion on a private Facebook group for home inspectors a few weeks ago. Shortly after I had shared a photo of a beautiful stairway, another home inspector piped in saying that while the stairway looked cool, it didn't meet code. Side note: technically, they're not called guardrails; just guards. The inspector's concern with this stairway was that the guards had horizontal cables that a child could climb like a ladder. That's a valid concern, and at one point in time, the building code actually prohibited this practice. 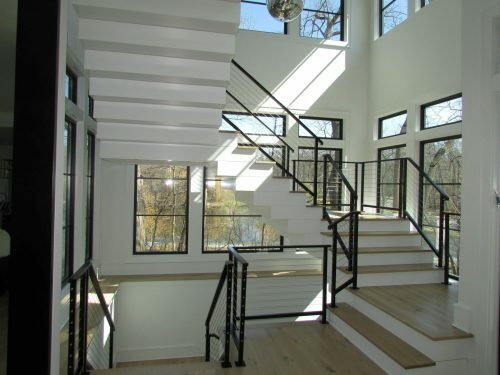 The 2000 version of the International Residential Code (IRC) says the following under section R316.2: Required guards shall not be constructed with horizontal rails or other ornamental pattern that results in a ladder effect. I don't own a copy of the 2003 IRC, but the 2006 IRC and subsequent editions contain no such language about guards. In short, there is nothing in the code that says you can't do this. It doesn't matter whether it's inside or outside the house. I don't know what prompted the change, but I suspect it was people's desire to install cable-rail guards like the type shown in the photo above. What should a home inspector say? As I've said countless times before, home inspectors are not code inspectors. Just because something doesn't meet "code" doesn't mean we report on it, and we often make recommendations for added safety that fall outside of the code. For example, I always recommend upgrading to photoelectric smoke alarms despite the fact that they're not required by code. If a home inspector feels that this type of guard is unsafe, they can report it as such. They could say that this type of guard could be climbed like a ladder and may create a safety hazard for children. There's nothing wrong with a home inspector pointing this out, provided they don't call it a code violation. Personally, I don't report on this type of detail because I feel that the hazard level created by the ladder-effect is quite low.